The Nissan Fuga (Japanese: 日産・フーガ) is a full-size luxury sedan produced by Japanese automaker Nissan since October 2004. It is built on a wider, stretched wheelbase version of the Nissan FM platform. 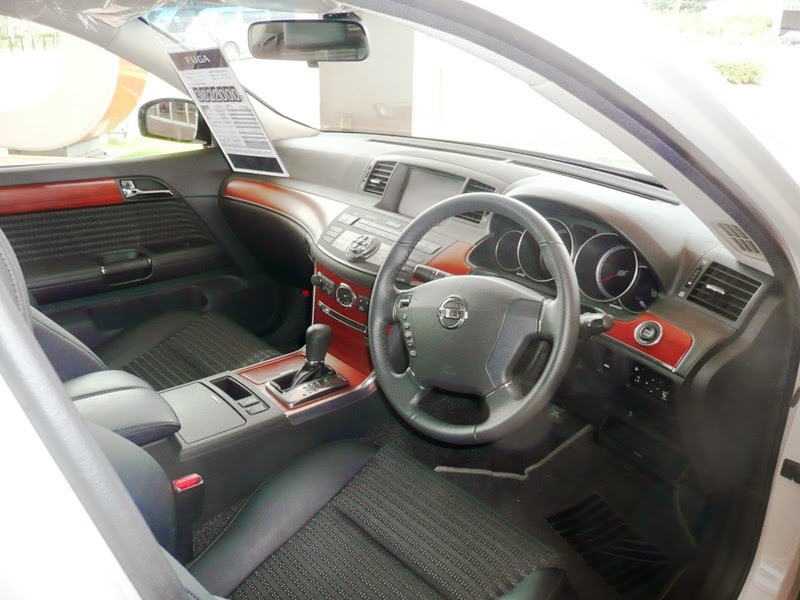 After the Nissan Cima and Nissan President were discontinued in August 2010, the Fuga became Nissan's flagship vehicle. In North America and Europe, the Fuga is sold as the second and third-generation Infiniti M, where it has been the flagship of the Infiniti luxury division of Nissan since 2006. First shown as the Fuga Concept at the 2003 Tokyo Motor Show, the Fuga is a replacement for the long running Nissan Cedric and Nissan Gloria series of cars and later succeeded the Nissan Cima along with the Nissan President. The name of the vehicle is the Italian word for the fugue, a composition musical form. The name Fuga was chosen to suggest that the long, storied histories of the Cedric, Gloria, Cima, and President are being combined into a new vehicle. When the Prince (Nissan) Gloria was first introduced in 1959, it was based on a stretched version of the original Prince (Nissan) Skyline, which was first introduced in 1957. Nissan used this approach again for the Fuga, using the Skyline platform again. The Fuga was available at Japanese Nissan dealerships called Nissan Red Stage and Nissan Blue Stage until Blue Stage and Red Stage dealerships were combined into one Japanese Nissan dealership network utilized internationally in 2005. Nissan wanted to create a fresh approach started by the Cedric/Gloria and focus its efforts to compete with European executive mid-sized sports sedans, such as the BMW 5 series, Audi A6, Mercedes-Benz E-Class and Jaguar S-Type. The Fuga's primary competitor from Toyota is the Toyota Crown Athlete Series, but also competes with the Lexus GS. The Fuga trim levels began with "XV" and ended with "GT" as the top trim package, equivalent to the previous "Brougham" and "Gran Turismo" versions of the Cedric and Gloria. In markets outside Japan it is sold as the second-generation Infiniti M (M35/45). The Infiniti M became the flagship of the Infiniti luxury division after the 2006 model year, as the Infiniti Q (the Cima's counterpart in certain markets) was discontinued. However the Cima would remain in production for the Japanese domestic market and it is 2" longer than the Fuga which slots below it in the lineup. The Fuga is also used as an uplevel taxi in Japan. Mitsuoka Motors, a small Japanese automobile company, uses the Nissan Fuga as a base for their Galue-III luxury sedan which has been produced since 2005. Aluminum is used in the body, hood, trunk lid and is also used in the doors internally to reduce weight. The front suspension uses a double wishbone setup, also to reduce unsprung weight, and to improve vehicle handling. This type of suspension was previously used on the Cedric/Gloria until 1983, when that platform began to use MacPherson struts for the front suspension, but still uses the multilink rear suspension which was introduced on the Cedric/Gloria in 1979. The Fuga uses aluminum alloy extensively in both the front and rear suspension components. The GT sports package includes Nissan's 4WS version of HICAS to improve stability and handling, taking advantage of the 53:47 weight distribution. A driver aid system used in Japan, called Distance Control Assistance, pushes the gas pedal against the foot when the DVD navigation with GPS determines that an unsafe speed is being maintained. If the cruise control is being used, the Distance Control Assistance will reduce speed automatically, and will warn the driver that an adjustment is being made with an audible bell sound. optional All wheel steering "Super-Hicas"
When the Fuga was first introduced for sale October 14, 2004 the advertising campaign used a musical work in the fugue style. The work is titled "Vortex", composed and arranged by Akihiko Matsumoto, and was specially commissioned for Nissan. The music was played in three movements by a full orchestra for 7 minutes and 42 seconds, and a recording was given to dealers in Japan as a promotional DVD-CD gift for customers called "Fuga The Movie and Premium Soundtrack", free of charge. The DVD and CD package was not available for private sale, with the DVD providing a gallery of images, and descriptions of key technologies such as how the adaptive cruise control functions, various safety technologies like the Blind Spot camera, which is a camera installed on the passenger side side view mirror displaying a view of the curb on the in-dash monitor, and a movie with the Fuga on a mountain road, using the "Vortex" soundtrack. The DVD is recorded in Dolby 5.1 surround sound. The second generation Nissan Fuga, introduced as the Infiniti M, was previewed at the 2009 Pebble Beach Concours d'Elegance. The new Fuga debuted at the 2009 Tokyo Motor Show. The production version went on sale across Japan starting on December 21, 2009. It is sold in overseas markets under the Infiniti nameplate as the third-generation M (M37/M56/35h/30d). While its predecessor's exterior was described as forgettable, the Fuga has curves influenced by Jaguar and Maserati, as well as a more organic look inspired by undersea creatures. It is a resurrection of a 1960s and 1970s appearance called "coke bottle styling" that was used on the 1970s Nissan Cedric and Nissan Gloria. The Y51 series Infiniti M / Nissan Fuga introduced November 2009 is only 50 mm (2.0 in) shorter than the F50 series Nissan Cima, with the same width dimensions of 1,845 mm (6.1 ft) and height of 1,515 mm (5.0 ft) compared to the Cima's of 1,490 mm (4.9 ft) height. On August 2010, the Fuga became Nissan's flagship with the announcement of the cancellation of the Nissan Cima and the Nissan President. The Fuga is 115 mm (4.5 in) shorter than the Nissan President, and the Fuga has a longer wheelbase at 2,900 mm (114.2 in), compared to the wheelbase on the President and Cima at 2,870 mm (113.0 in). When the Fuga assumed the role as flagship sedan of Nissan Japan August 2010, it became the first time that Nissan didn't sell a premium luxury V8 sedan in Japan; the Fuga's North American cousin, the Infiniti M56, is offered with a V8 shared with the Infiniti QX56. The VK45DE V8 engine used in the previous generation is no longer offered in Japan, neither is the succeeding VK56VD V8 which is only found on the Fuga's North American counterpart, the Infiniti M56. The VQ35HR 3.5 L V6 Hybrid is now the Fuga's third engine option, utilizing the Atkinson cycle. The electric motor, installed in parallel between the engine and the transmission, produces 68 PS (50 kW; 67 bhp) from 1.3kWh lithium-ion batteries that are expected to have a service life of 10 years. The batteries are installed upright behind the rear seats. The Fuga Hybrid introduced Nissan's first in-house developed electric hybrid technology, and Nissan claims it will double the fuel economy of its gasoline-powered version. A driving mode selector knob has been installed as standard equipment on all models, situated below the transmission gear lever and between the heated and ventilated front seat controls, providing four selections labeled "Standard", "Sport", "Eco", and "Snow", allowing the 7-speed transmission, engine and various systems to optimize driving based on varying conditions. To minimize exhaust noise intrusion into the passenger compartment from the engine at low RPMs, "Active Noise Control" has been installed. Double-piston shock absorbers, developed by Kayaba Industry Company, have replaced the ones previously supplied by Hitachi. Trim levels offered in Japan start with the 250GT, 250GT Type P, 250GT "A" package; 370GT, 370GT FOUR (AWD), 370GT FOUR (AWD) "A" package, 370GT Type S, with the 370VIP at the top of the range. The 370GT Type S uses 20" Potenza RE050A 245/40 tires, with other trim packages using Dunlop SP Sport Maxx TT 245/50 tires on 18" with all wheels consisting of alluminum alloy. Some of the optional interior equipment includes heated and ventilated front seats, power reclining rear seats, power ottoman for the rear passenger opposite the driver, and HDD navigation combined with a telematics subscription service called "CarWings" in Japan. Safety technology has also been introduced, such as Lane Departure Prevention, which uses a small camera mounted above the rearview mirror to gauge distance from the lane markers, and will lightly tap selected brakes when necessary to help ease the car back into the correct lane. It will allow for unimpeded lane changes when the turn signal is used, and will yield control to the driver at all times. The Nissan Fuga Hybrid, together with the Nissan Leaf, will include Nissan's new Vehicle Sound for Pedestrians system to alert pedestrians, the blind and others to their presence when the hybrid is operating at low speeds in all-electric mode. Last updated on 24 June 2014 at 07:34.